The former Texas congressman spoke at a rally at the same time as Trump. 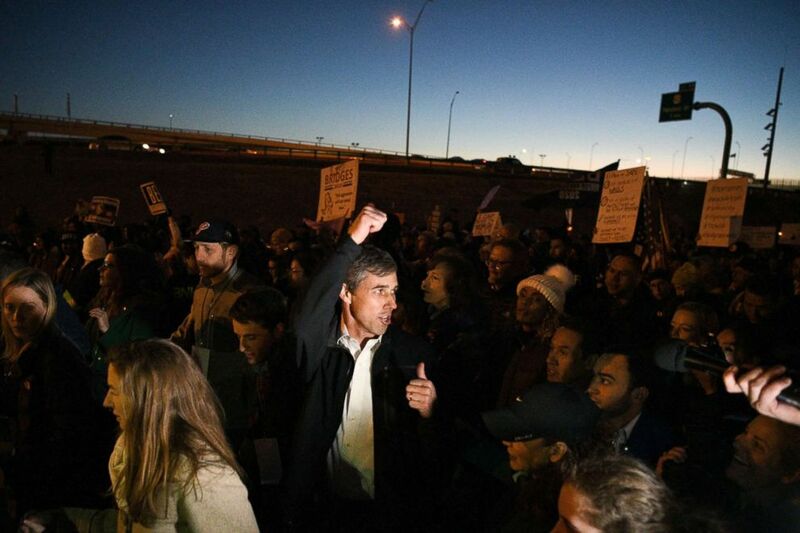 Former Texas Congressman Beto O’Rourke had his first opportunity to test the 2020 presidential election waters Monday night while speaking at a march celebrating El Paso’s immigrant culture at the same time President Donald Trump held a rally down the street to promote the border wall. "We are making a stand for the truth, against lies and hate and ignorance and intolerance," O’Rourke said. "El Paso has been the safest city in the United States of America not in spite of the fact that we’re a city of immigrants but because we are a city of immigrants." O'Rourke remains one of the most high-profile Democrats yet to officially declare a bid for president. However, his remarks hinted at the importance of the upcoming election. (Loren Elliott/Reuters) Beto O'Rourke, the Democratic former Texas congressman, participates in an anti-Trump march in El Paso, Texas, Feb. 11, 2019. “Let’s make sure that our laws, our language and our leaders reflect our values, who we are, our experience,” O’Rourke said. 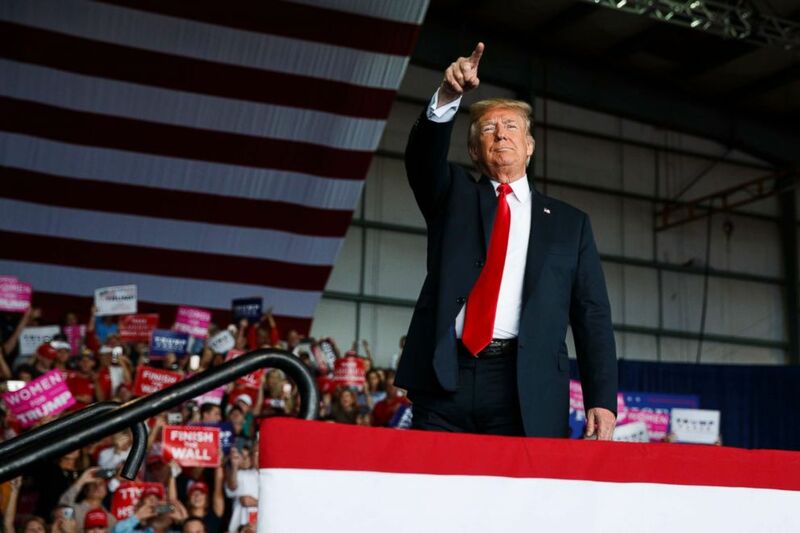 Meanwhile, the president held his first campaign rally of 2019 Monday night in a border city with unmistakable symbolism amid the stalemate between his administration and Democrats in Congress over immigration reform and border security, and the country facing the possibility of another government shutdown this Friday if a deal cannot be reached. Trump called out O’Rourke early in his remarks, calling him "a young man who’s got very little going for himself, except he’s got a great first name." At the same time, O'Rourke, who represented El Paso in Congress for six years until his unsuccessful bid for the U.S. Senate against GOP Sen. Ted Cruz last year, spoke at a local high school alongside other prominent Texas Democrats. The group was then going to march toward the venue where Trump's rally was taking place. (Eric Gay/AP,FILE) Rep. Beto O'Rourke, the 2018 Democratic Candidate for U.S. Senate in Texas, makes his concession speech at his election night party in El Paso, Texas, Nov. 6, 2018. In a blog post published last week, O’Rourke was explicitly critical of Trump and called his rhetoric towards immigrants “racist” and “inflammatory.” He also listed 10 policy solutions to solve the immigration crisis, a departure from the anecdotal ramblings he was criticized for in a January Washington Post interview. In a video posted on his Twitter account over the weekend, O'Rourke previewed the event and put out a call for "everyone in El Paso to turn out." "We will meet lies and hate with the truth and a vision for the future from the U.S. Mexico border," O'Rourke said sitting alongside his daughter Molly. In a tweet posted Monday morning, Trump said he would be giving a "Big speech on Border Security and much else tonight." Trump kicked off a flashpoint in El Paso during his State of the Union speech on Tuesday when he said, "The border city of El Paso, Texas, used to have extremely high rates of violent crime -- one of the highest in the country -- and considered one of our nation's most dangerous cities. Now, with a powerful barrier in place, El Paso is one of our safest cities." While El Paso does now have a wall in some locations, its crime rate had already dropped substantially in the years prior to its construction in 2008, according to FBI's database provided by the El Paso Police Department. There were 3,662 violent crimes in the city in 1985, which declined to 2,574 by 2007. It has remained stagnant since. The competing rallies offer a hard-to-avoid preview of a possible 2020 presidential match-up between Trump, 72, and O'Rourke, 46, and comes as the Democratic presidential field continues to grow. Before leaving for Texas earlier Monday, Trump took a jab at O’Rourke over their potential crowd sizes. The president said 75,000 people signed up to attend his El Paso rally, but lamented the indoor arena can only hold 8,000. Once at the rally, the president claimed that thousands more people showed up for his rally than O’Rourke’s event. Over the weekend, Massachusetts Senator Elizabeth Warren and Minnesota Senator Amy Klobuchar each formally entered the race for the White House. (Kathy Willens/AP) Former Democratic Texas congressman Beto O'Rourke laughs during an interview with Oprah Winfrey for "Oprah's SuperSoul Conversations from Times Square," Feb. 5, 2019, in New York. 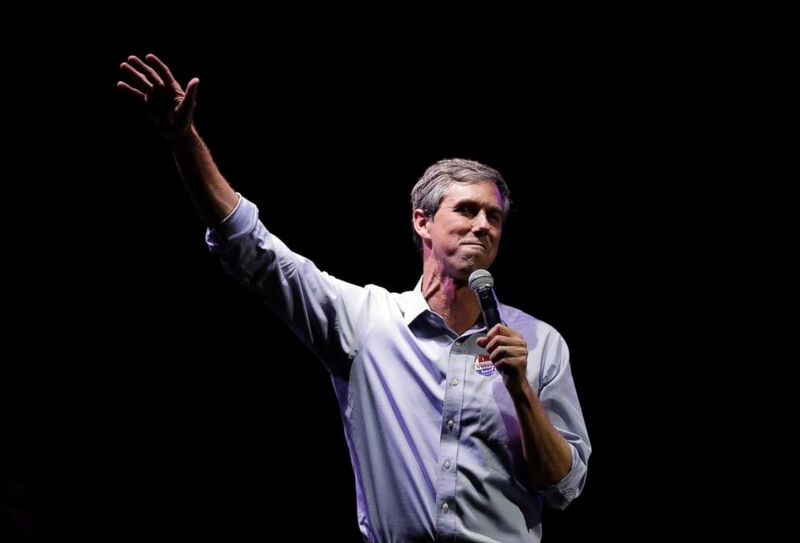 But despite the presidential speculation, it remains unclear whether O'Rourke will mount a run for the Democratic nomination in 2020. 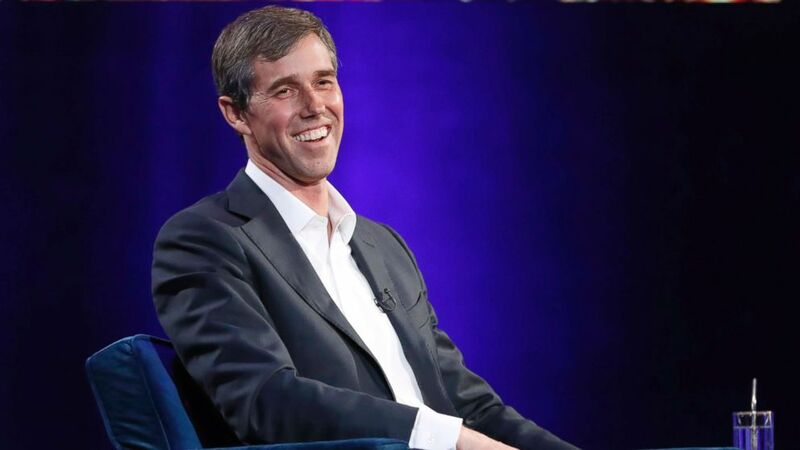 In an interview last week with Oprah Winfrey, O'Rourke said he will make a decision on a presidential run before the end of February. "The serious answer is really soon,” O'Rourke told Winfrey, “before the end of this month." While he ultimately fell just over 200,000 votes short in his bid to unseat Cruz in 2018, O'Rourke garnered national attention for his unorthodox campaign that frequently live-streamed behind the scenes footage of the candidate and his penchant for offering his unfiltered thoughts on issues ranging from national anthem protests in the National Football League to the legalization of marijuana. During his race against Cruz, Trump referred to O'Rourke as a "total lightweight," and said he "will never be allowed to turn Texas into Venezuela." (Evan Vucci/AP, FILE) President Donald Trump arrives to speak at a campaign rally in Macon, Ga., Nov. 4, 2018. In an October 2018 interview with ABC News' Paula Faris, O'Rourke said he would not be responding to Trump's attacks. "The kind of bitterness and the name-calling and partisanship that has unfortunately defined so much of the national conversation, you can add more to it or you can stay focused on the future," O'Rourke said at the time.